"Archives are the paydirt of history ... everything else is just opinion"
We are looking to expand our number of interviews in both Australia and South Korea. The number of visitors to the site, see here, indicates that there is a real demand for our interviews and this is very encouraging. However, we need your help. We cannot continue to fund the intervies as we have done in the past and we do not believe we should charge the artist for their interview, they contribute enough already (their time, their story, their artwork, access to their studio, ect). So, consider if you would like to support this project and make it greater and more comprehensive. We offer two sponsorship opportunities, either sponsor a single interview or a theme of interviews or click the button below to make a donation. All donations wil help us to publish more interviews. Click here to see the Sponsorship page for more details. The project has been featured in the prestigeous Voices in Contemporary Art (VoCA) blog on the 7th of July 2017. During 2017, Dr Bob Jansen, a founding director of this project, accepted a three month residency at the prestigeous Asia Culture Center in Gwangju, South Korea. The residency, part of the Creator in Lab program, introduced the ACC to our Testimony Software technology for publishing engaging oral histories online. During the residency, we recorded and published an interview with Korean monochrome artist, Kang Un. The project has contributed to the Kim Dal Jin Art Archive and Museum, the most prominent archive of contemporary art in South Korea. The archive has accepted catalogues and monographs from some of the Australian artists who took part in our exhibition in Seoul in 2016, including Yvonne Boag, Ann Thomson, Ken Reinhard, Alun Leach-Jones and Andrew Christofides. Thanks go to the artists for contributing this material. Our web site has been archived in the National Library of Australia's prestigeous Pandora archive and is now accessible through the TROVE system. "PANDORA, Australia's Web Archive, is a growing collection of Australian online publications, established initially by the National Library of Australia in 1996, and now built in collaboration with nine other Australian libraries and cultural collecting organisations. The name, PANDORA, is an acronym that encapsulates our mission: Preserving and Accessing Networked Documentary Resources of Australia." This image shows the statistics for the Cultural Conversations web site recorded by our web service, between August 2017 and May 2018. This is a wonderful metric for our web site and demonstrates the international audience demand for our interviews. Cultural Conversations is a project of the Australian Centre for Oral History, promoting cross cultural exchange by building a living archive of the stories of Australia's and South Korea's eminent visual artists. The interviews are freely available world wide through our web site. All interviews are available in English and the Korean interviews are also available in Korean. For more information, please contact Dr. Bob Jansen vial email. Cultural Conversations wants to collaborate with any relevant project or team to ensure we add value to each other's efforts and reduce duplication. If you wish to collaborate, please contact Dr. Bob Jansen using the form or email below. We currently collaborate with the Design and Art Australia Online who provide access to the CV's and other professional details of Australian artists. Dr. Bob Jansen is a founding director and the chief scientist of this project. Adjunct Associate Professor Yvonne Boag is a founding director and a member of our selection committee. Dr. Paul McGillick is a founding director, a member of our selection committee and chief interviewer in Australia. Professor Bob Miller provides marketing advice to the project. To contact Bob, send him an email. We acknowledge the assistance of Emeritus Professor Peter Pinson, who was a member of our selection committee and an interviewer in Australia. Peter has passed away and we miss his energy and excitement for the project. All the contents of this web site, including the interviews, are used subject to licenses from the appropriate copyright holders. We respect the copyright of others and expect you to respect our copyright. If you believe we have infringed your copyright, please contact Dr. Bob Jansen, via email, to discuss and we will do all in our power to rectify any proven infringement. We will not knowingly divulge any personal information collected by your use of this web site unless required to do so by law. Testimony Software, the software that powers the interviews, is the copyright of Turtle Lane Studios Pty Ltd. This web page has been developed using the free Mobirise web page builder. You can download your own copy from the Mobirise web site. “Whilst in Germany, I took the opportunity to listen to each of the Australian interviews. “The Cultural Conversations exchange project, with its online oral history archive, provides a unique opportunity for audiences to learn about the life works of eminent contemporary Australian and Korean artists and gain an insight into Australian and Korean art and culture, through eyes of these great artists. “Cultural Conversations provides an important platform for the exchange of culture, history, language, dialogue and artistic expression through strong interchange between Korea and Australia. I am a strong believer in the importance of bilateral relations and diplomacy at all levels – through political and security cooperation, trade links, social ties, and cultural partnerships. 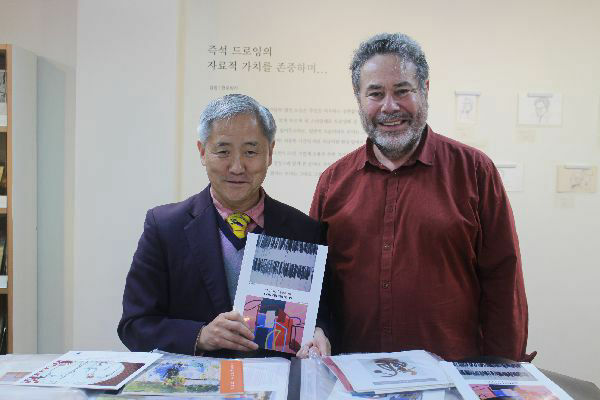 Through artistic exchange, Cultural Conversations is working towards furthering and deepening the understanding and friendship between Australia and Korea." "Cultural Conversations represents pre-eminent artists from both countries and their works across a wide range of mediums spanning painting, sculpture, installation and performance. Cultural Conversations offers audiences an opportunity to explore the modern and contemporary art scene in Korea and Australia through the in-depth discussions between artists and art experts. The professionally filmed interviews will remain as invaluable resource for not only the public who are interested in art, but also future students and historians. I hope that by bringing Korean and Australian artists together we may foster an ongoing understanding and conversation between the two countries." I felt quite honoured to be asked to be involved in the Cultural Coversations project. The whole excerise was handled so professionally and I was made to feel an important component within the project. All the artists involved understood that this excercise not only promoted their work in Australia through the web site, but also spread the word internationally. The visual arts are often forgotten as a measure of a country's cultural maturity and as a means by which communication can take place in a positive way across not only Australia but also the world at large. The effort and resources contributed by Dr. Jansen, to this project is far in excess of the meagre reward of knowing that he has contributed in no small way to enhancing Australia's place in the development of the arts internationally. Whatever assistance can be offered by government instrumentalities will obviously be paramount in enabling the project to continue and to flourish. The concept of video interviews accompanied with extensive examples of the artist's work is, I believe somewhat unique to this project, and makes the communications so much more meaningful and enjoyable for the viewer. The recent exhibition exchange initiative of Dr. jansen, proved to be an enormous success and must lead to a greater understanding between different cultures. The visual arts needs Dr Jansen and he, in turn, must have support and encouragement, especially from the government. Contact us to discuss collaboration, sponsorship, etc.